Hypercholesterolemia is one of the most commonly encountered diagnoses in outpatient family medicine. It would be impossible to pick a day on my schedule and not find at least 30 to 50% of my patients having a statin medication on their medicine list. Many more, one could argue, probably should have a statin medication on their list. 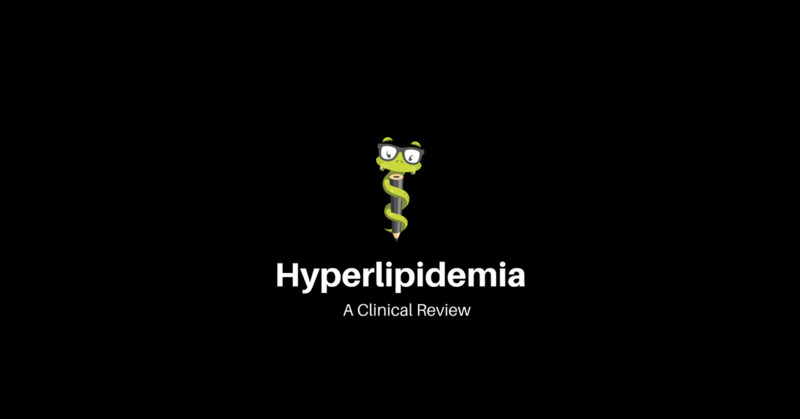 This article will review the screening, diagnosis, management, and treatment of hyperlipidemia. By definition, hyperlipidemia is serum total cholesterol greater than 200 mg/dL. The total cholesterol is made up of HDL, LDL and VLDL. Low density lipoprotein is plaque forming, or atherogenic. Long term periods of high LDL result in the deposition of cholesterol plaques in the coronary arteries. Chronic inflammation causes atherogenic plaques to be unstable and rupture, causing acute coronary syndrome. High density lipoprotein is cardio-protective and discourages plaque from accumulating in the arteries. The goal in patients with risk factors for coronary artery disease is to reduce the LDL and increase HDL as best as possible. Long term periods of hypercholesterolemia is a significant modifiable risk factor for coronary artery disease. Risk factors for primary hyperlipidemia include obesity, sedentary lifestyle, and eating a diet that is high in total cholesterol and saturated fat. Unfortunately, the advent and continued plethora of fast food options and foods cooked in fatty oils continues to influence this country’s obesity problems as well as our significant hyperlipidemia. Secondary causes of hyperlipidemia include hypothyroidism, diabetes, nephrotic syndrome, liver disease, renal failure. Medications that can cause hyperlipidemia include carbamazepine, second generation anti-psychotics, anabolic steroids, protease inhibitors, and corticosteroids. (Tong and Brooks, 2016). Familial hypercholesterolemia is an important cause of hyperlipidemia and carries significant risk for early onset CAD. Screening should be performed at an early age and patients should be asked if there is any family history of early onset hyperlipidemia. The American Academy of Pediatrics now recommends getting a baseline lipid panel in children ages 8 to 11 if there is an elevated BMI, or a family history of CAD. Patients with familial hypercholesterolemia or very high cholesterol in general may exhibit physical exam signs such as tendinous xanthomas, or xanthelasma. The United States Preventive Task Force recommends baseline total cholesterol for all men greater than 35 and women greater than 45 years of age. These are both grade A recommendations. In patients ages 20-35 with risk factors for hyperlipidemia such as elevated BMI, hypertension, family history, sedentary lifestyle, and the task force makes a B recommendation. Thankfully, many insurance companies are realizing the importance of routine preventive screening related to hyperlipidemia. Given the long latent period of developing coronary artery disease, there is great benefit in screening for hyperlipidemia. Many employers are also offering yearly wellness screening which may include a lipid panel. As discussed above, hyperlipidemia is defined as a total serum cholesterol greater than 200 mg/dL. A cholesterol panel will include a total cholesterol, LDL, HDL, VLDL and triglyceride level. Reference ranges vary by age and gender. An additional risk factor for atherogenesis is chronically low HDL. Some laboratories will also include a cholesterol “ratio”. This is simply a ratio of the total cholesterol divided by the HDL. Ratios that are higher indicate a higher risk of coronary artery disease, while lower ratios are optimal. As one can see, having a lower HDL is a significant risk factor for atherosclerosis. Once a cholesterol level is drawn, management is significantly important. Having a shared conversation regarding the importance of lowering cholesterol with your patient is paramount. In patients with young age and no other risk factors for coronary artery disease, a 3 to 6 month trial of diet and exercise is useful. Many patients unfortunately have very little experience in nutrition as a metric of health. Patient education for patients with mild elevations in cholesterol is very important. Reviewing the recommendation from the American Heart Association for 30 minutes of moderate intensity exercise is also very important, as exercise increases HDL levels. Many patients may eat a lot of prepared, greasy and fried foods which are cooked in saturated fat and are loaded with cholesterol. Some foods that are high in cholesterol include fast food, hamburger meat, steak, eggs, some seafood such as shrimp, clams, and lobster. Leaner options may include egg whites, turkey, and chicken. Patients with clinical evidence of CAD (prior myocardial infarction, stroke, TIA, or peripheral vascular disease diagnosis). Patients with an LDL level greater than 190 mg/dL. Patients with an ASCVD risk calculation > 7.5%. The ASCVD risk calculator is a risk tool analysis that inputs the patient’s age, race, smoking status, blood pressure, cholesterol values, and presence of absence of diabetes. The tool then releases a number which indicates the chance, in percent that the patient will have a cardiovascular event such a heart attack or stroke in the next 10 years. The above patient group is generally recommended to be on a statin for risk reduction of coronary artery disease. Some clinicians indicate that the ASCVD risk may over-estimate the chance of heart disease and one study actually found that 96% of men over the age of 55 would be recommended to be on a statin if the above “big four” were followed. Along with dietary and exercise changes, statins, or HMG-CoA reductase inhibitors are the first line treatment for hyperlipidemia. The above group categories are recommended to be on “high intensity statins”, which consist of atorvastatin 40-80 mg daily and rosuvastatin 20-40 mg daily. Moderate intensity statins may be used in patients with high cholesterol but no evidence of CAD. Some examples include lower doses of atorvastatin or rosuvastatin, simvastatin, pravastatin, or lovastatin. Insurance companies may prefer a particular statin for financial reasons. High intensity statins can lower LDL cholesterol 30 to 50% from the baseline cholesterol, which in turn can slash the ASCVD risk and prevent long term complication. In the decision making to start a statin, it is sometimes helpful not only to illustrate to a patient what their ASCVD score is at baseline, but also showcase the reduction that would be expected if a high-intensity statin is initiated. It is not uncommon for a 10% ASCVD risk to become a 2 to 3%. Contraindications to statins include active liver disease, pregnancy and lactation. Generally, statins are well tolerated but may cause myalgias or even rhabdomyolysis. Patients developing muscle pain, muscle weakness may require removal of the statin or reduction in dosage. Another side effect of statin medications is an increase in liver enzymes. A baseline liver function test is reasonable to assure that the patient’s liver enzymes are not already elevated. Once a statin is initiated, a new cholesterol panel should be drawn in 8 to 12 weeks to assess the improvements in LDL, as well as a liver hepatic panel to assure that liver enzymes have not increased. It is reasonable to discontinue the statin if an increase in transaminases greater than 3 times the normal limit is observed. Another second line option for novel treatment or adjuvant treatment is ezetimibe, or zetia. This medication works to lower LDL and is available in a combination with simvastatin as Vytorin. Although useful to decrease LDL, it has not been shown to decrease mortality like statins have. Another class of medications that work on both hypertriglyceridemia as well as elevations in LDL are fibrates. Mediations include Gemfibrozil, fenofibrate. Fibrates also have the ability to increase HDL. Side effects include GI symptoms such as nausea, belching. Dietary supplements and vitamins are available to help lower cholesterol. A diet high in omega 3 fatty acids or fish oil may be helpful. Dietary sources include salmon, flaxseed, canola oil, olive oil. The Mediterranean diet may be considered to be cardio-protective, as it is lower in total fat, total cholesterol and high in omega 3 fatty acids. Hyperlipidemia remains an important long term cause of coronary artery disease. Along with a sedentary lifestyle and a diet high in total fat, many Americans have elevated cholesterol. Routine screening for hyperlipidemia is very important for primary prevention of heart disease. The “big four” indicators of patients benefitting from high intensity statin therapy is important to review. Statins, dietary changes, and a regular exercise regimen remain the hallmarks of treatment of hyperlipidemia. Tong, S.T and Brooks, W. (2016). Hypercholesterolemia. The Five Minute Clinical Consult. Cholesterol to Reduce ASCVD Risk. American Family Physician, 15;90 (4): 260-265. Lipid Disorders in Adults (Dyslipidemia): Screening. United States Preventive Task Force Services. Date of access: 18 March 2018.